We are underway. After months of planning, which saw us rent our house and give away most of our belongings, and an extensive refit, which changed the face of our boat both inside and out, here is a photo of us as we left the marina. SV Aphrodite leaving marina. My husband, Rick, is at the helm. I’m on the foredeck taking in the fenders. We may have looked like we were out for a day sail. But, our plan is to sail for at least two years, possibly more. I was happy to share our moment with a family on shore who understood the significance of our departure. I had the good fortune to meet this family via my blog, and then in person at the marina. They have just bought a Leopard 46. 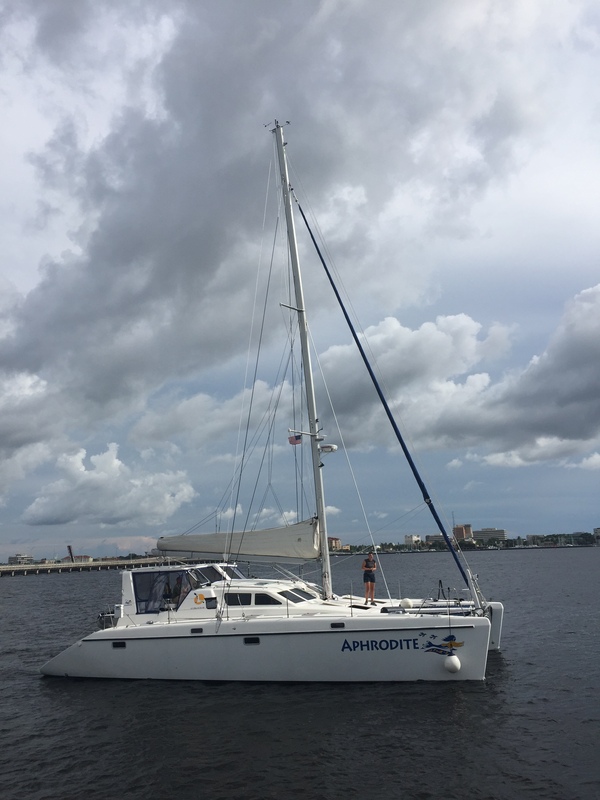 They have three kids, and plan to start their own cruising adventure next summer. It feels magical to be on our way. Our kids are thrilled to be able to sit on the front of the boat, tethered to jackstays. But, the weather and surroundings have thrown us some curves. Also, I am battling seasickness, which has not squashed my enthusiasm but does make me recoil at the smell of fish. Yesterday, we sailed at night (a first for me) through blinding rain to seek an anchorage to accommodate our boat. We sailed for 15 hours. It was a long day. I’m not one to complain but the rain was strong enough that it physically hurt my face to keep watch. The wind threatened to lift my eyeglasses right off my face. I now have them tethered to my head. Fortunately, post-refit, we have a canvas enclosure for shelter. We also have radar, and a powerful spotlight mounted on our bow to scan for hazards. The spotlight can be operated by the helm or with a handheld remote control. These tools along with our chart plotter were very useful for night sailing, particularly during a storm. We are in an area fraught with low bridges and shallow water. It was tricky to find an anchorage that provides enough clearance for our 70 foot mast, and our 4.5 foot keel. Meanwhile, our children seem to have discovered an interest in being outside on the boat, drizzle or shine. They spend most of their time marveling at the waves, watching for jelly fish, and shrieking with delight as spray emerges through our trampolines. One day, we saw a spectacular pod of about ten dolphins follow alongside our boat. And, we caught our first fish – a Spanish mackerel – which provided our kids a lesson about anatomy, and where food comes from. Our adventure has just begun. Tomorrow we will do a more moderate sail. And, despite my seasickness, and having lost our supply of Scopolamine (seasickness medication), my spirit is not squashed. Even Lord Nelson was prone to seasickness. I am confident that, with time, my seasickness will abate and there will be lots more to tell you. Previous As Canadian as a catamaran? Hope you feel better soon! I use Stugeron, you can’t buy it in New Zealand so I get it from an online chemist in the UK. Good luck! Hi! i have been doing well since I wrote this blog post. I have bought some Dramamine just in case. Fingers crossed that I won’t need it. Thanks for your note! Hi – it’s nice to hear from you! We are doing well, and are in a well-protected anchorage. We are in no hurry, and are quite willing to take our time – putting safety over speed – and we are watching the weather closely. That said, the hurricane is on our minds, and we’ll be glad when it dies down.